OH MY GOD! This Soy Meat Recipe is one of the closest substitutes to Meat EVER! I am proud to say that I have been off meat since 2004. At times, I would relish having some meat substitutes like Paneer (a fresh cheese common in South Asia), Tofu, Mushroom etc and was content with the same. Once I became a vegan, Paneer was off the charts too. I happened to read about the meat alternatives and was wondering if I could get any substitute to meat locally. I enquired about the same with a few local super markets, groceries etc but could not find anything interesting. One fine day, when I visited a fine dining restaurant, I came across an interesting dish – Marinated soya chaap sticks (Soy Meat Recipe). Take a bigger bowl (as shown in the video). Put Soya Chaap (Soy Meat) in it. Pour some lemon juice and salt, pepper, garlic and onion powder, garlic and ginger paste and some hot sauce. Mix it well and cover it with a Cling Wrap. Marinate the Soya Chaap for about 1-2 Hours. In a bowl, add all-purpose flour and gram flour. Add some aquafaba and mix the ingredients to make the batter to medium thick consistency. To achieve a crispy and crunchy outer layer for Soya Chaap , we will season the bread and cornflakes crumbs. In a plate, add some bread crumbs, cornflake crumbs, salt to taste, pepper, onion powder, garlic powder, mango powder, red chilli powder, garam masala and chaat masala. Mix all the ingredients to make the bread coating. 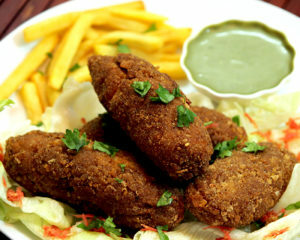 Dip each piece of marinated soya chaap in the batter; let the excess batter drip off. Then roll it in the bread coating. Repeat this process twice and keep it aside in a plate. Place the soya chaap slowly into the hot oil and fry till it turns golden brown. Serve hot with cilantro dressing.